Cardiac rehab is a structured program of monitored exercise and education designed to guide participants towards achieving their optimal physical, psychological, and social abilities with lifestyle modification and peer support. The program is open to anyone with cardiovascular disease and has had an event such as coronary stents, coronary bypass surgery, heart attack, heart valve repair or replacement, heart failure, and others. A referral by a physician is needed to participate in the cardiac rehab program. Cardiac rehab usually starts soon after a cardiac event. The program is usually 12 weeks long and is individualized to meet each participant's specific needs and goals. If you are interested in the program, are a candidate, or have questions please contact 715-463-5353 ext. 7481. The cardiac services department also performs several different stress tests. One of the stress tests performed here is the Cardiolite stress test which is performed in conjunction with Shared Medical Technology. These are specialized tests that take about four hours to complete using nuclear imaging with the EKG's. 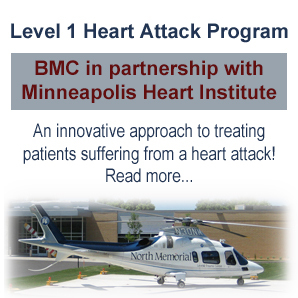 We also perform Stress Echo's in conjunction with Minneapolis Heart Institute. If you have any questions regarding stress tests please call 715-463-5353 ext. 7205. The clinic enables people on Warfarin (Coumadin) to have their INR level drawn by a finger stick. During the appointment, the patient will receive warfarin dosing instructions, have any questions answered, and have another INR appointment scheduled. 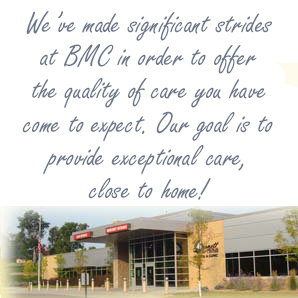 A referral by a Primary Care Physician at BMC is needed to be seen in the Anticoagulation Clinic. If you are on warfarin and are interested in the clinic or have questions, please contact the AC Clinic at 715-463-5353 ext. 7401. "The Cardiac Services Department offers a Cardiac Rehabilitation Program, an Anticoagulation Clinic, cardiac stress tests, and holter monitors for the heart. Heart health is our passion."